Do something amazing and make a difference. 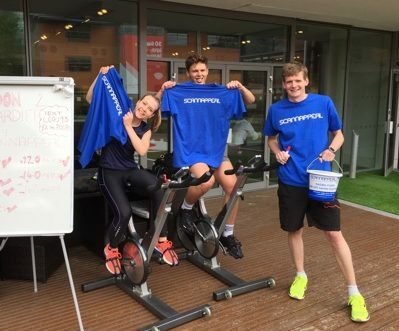 By getting involved and choosing to fundraise for Scannappeal we can continue to improve the lives of patients across Buckinghamshire. Every penny and pound raised will allow us to provide the best possible medical equipment for our local hospitals. If you have a fundraising idea to run with or need some help to make something happen please get in touch – we are here to help and support. Together we can make fantastic things happen. 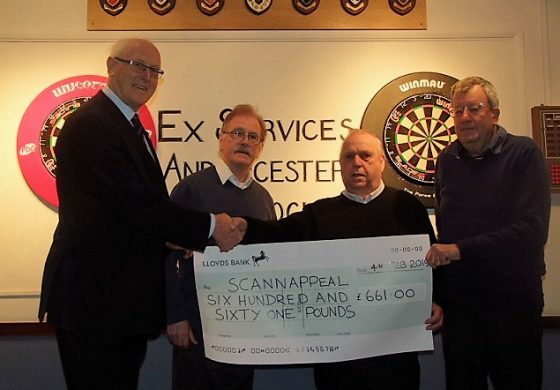 The Bicester Darts Association has recently raised £656 for Scannappeal through a darts competition. The event was supported by Trevor Cox of Trusted Cards Ltd who donated a shield for participants to play for. Trevor was diagnosed with a severe eye problem in 2016 with which he lost his sight. He was a patient at Stoke Mandeville Hospital where he was nursed back to health by the Ophthalmology staff and in gratitude, Trevor wanted to give something back to them by raising money for the Eye See Appeal. Photos of presentation, left to right: Roy Collis,Clive Cooper (secretary Bicester Darts), Trevor Cox (Trusted Cars Ltd) and Keith Lennard (Accounts for Bicester Darts).